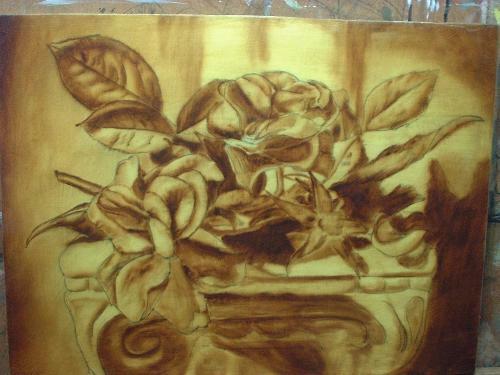 Roses on Pedestal an oil painting lesson. Roses on Pedestal. 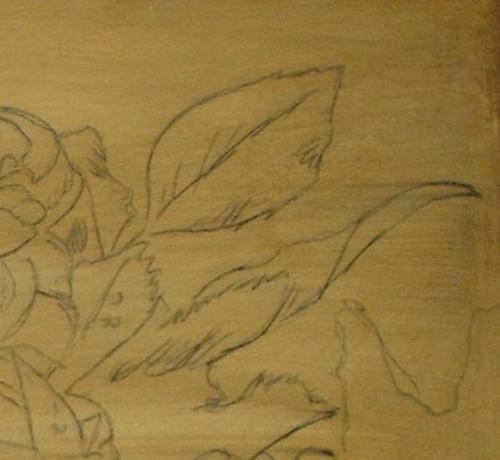 An early work where you will see a few better closeups of the umber layer. Unfortunately, the dead layer pictures are not available and we will go straight to the finished painting after these photos. At least with the finished layer, I have some nice close ups also that show the brush work. This was a 9" X 12" oil painting on masonite board. 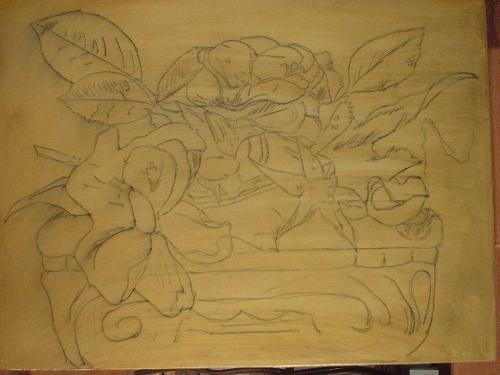 I have a full explanation on how to prep a masonite board for painting here. 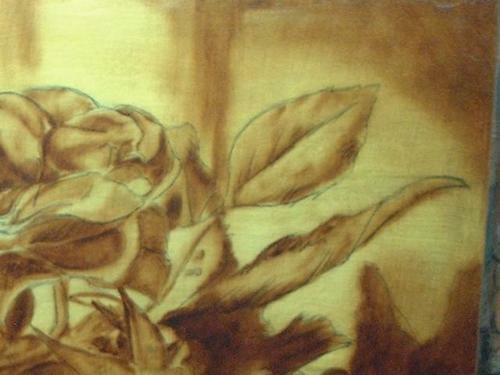 This is a close up of the (toned canvas) and underlying ink drawing for our roses on pedestal painting. Notice there are a few brush strokes seen in the toned canvas but it's overall tone is slightly lighter than my middle tone. 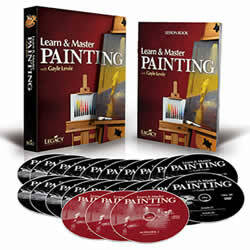 I talk about how to determine that within my Real Art Lesson ebook. This is the completed umber under layer. Note some of the details I have captured, notably the dew drops. Here is a close up of the left leaf. There are many nuances that are captured here in the leaf structure. This is a very light coating much like a watercolor in that paint is applied, then utilizing your dry blending brush, paint is removed or lightly touched to smooth out the transition from light to dark. I think I've really captured the roundness in each segment of the leaf here. 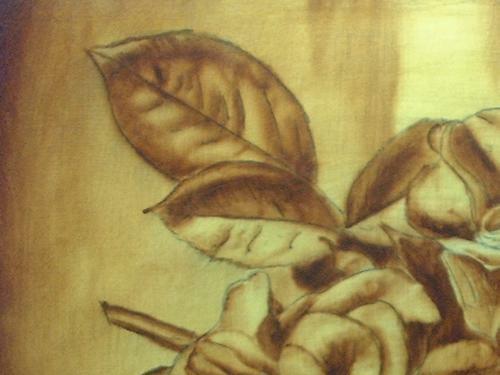 Working the umber like a watercolor has given me a beautiful effect that will carry through each layer above it! Those soft folds even at this point in the painting are wonderful, something that is extremely difficult with direct painting methods. Not impossible, but difficult. Here is another closeup. The pedals on the right are depicted. Again, using the thinned umber paint, it is applied, then with a clean dry brush, some can be picked up and removed where you want a the lighter under coat to show through. Click here to head back to the top of our roses on pedestal demonstration. Click here to see the finished piece of this demonstration.